Rita Jane Freeborn, age 70 of Madison, OH passed away on May 21, 2018. She was born on October 31, 1947 in Painesville to the late Robert and Ethel (Sorvisto) Freeborn. Rita received her Master's in Horticulture from Penn State and went on to become a Master Gardener with Cooperative Extension and worked for the USDA collecting and documenting invasive insect species. Rita is survived by one sister, two brothers, two sisters-in-law, nine nieces and nephews and seven grand-nieces and nephews. 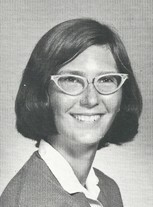 Rita was one of our National Merit Scholars, and was a team-mate on Riverside's winning "Its Academic" TV Quiz show in our senior year. I'm very sorry to hear of her passing. So sad to hear about Rita's passing away. I remember her a s kind, friendly person. I am very sorry to hear of her passing. She was indeed one of our true stars. Sadness at Rita's passing. Fond memories of a gentle, smart, friendly classmate with a lovely smile. Prayers to her family and friends at this difficult time. Very sorry to hear of Rita's passing. She was always very kind not to mention smart.